If you love meat, smoke and maybe a bit of hot sauce and kimchi, then you're in the right city. In Melbourne, there's no shortage of quality barbecue, whether you're looking for American-style brisket in Brunswick or Korean cuts in the CBD. Our barbecue is so sophisticated that, these days, barbecue had infiltrated fine dining and, at some spots, even vegetarians are fully catered for. One place even has a karaoke room. As luck would have it, these joints have also perfected the art of barbecue drinking — crack a tinnie just like you're in your mate's backyard, order a glass of funky orange riesling or go for soju in every variety available. 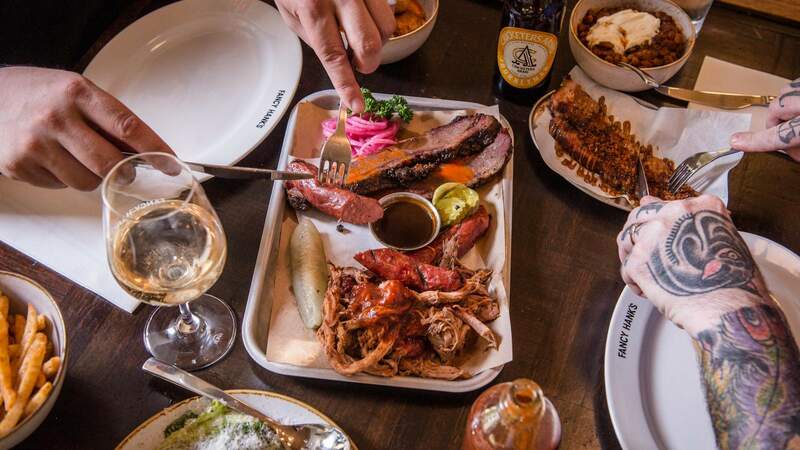 Here are some of our top picks for all things barbecue (and booze) in Melbourne. Texas-style barbecue meats are Bluebonnet’s speciality — and, at its new Brunswick East home, you’ll find fall-of-the-bone meats and a tinnie or two to wash it all down. Starting with some smaller nibbles, wood-roasted broccoli with lemon and salsa verde, baby gem lettuce with parmesan and anchovy aioli as well as chargrilled sweetcorn with salted ricotta are all seamless accompaniments for the chunky meat dishes for mains. 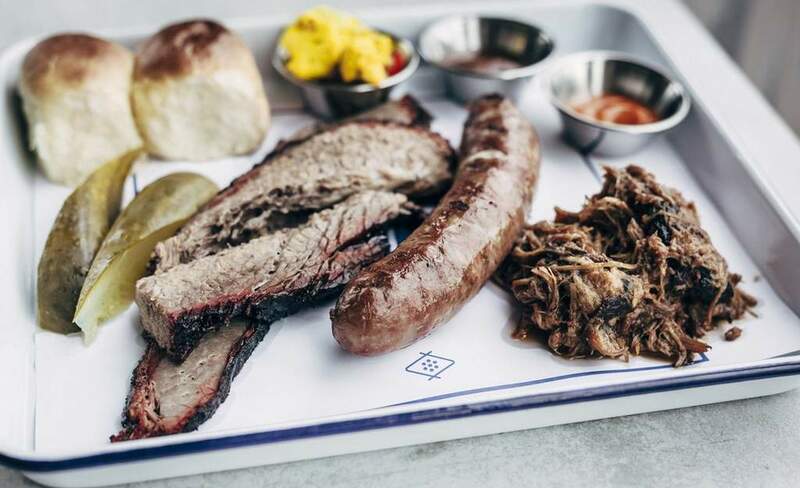 Speaking of, Bluebonnet stocks a smokey array of meats, venturing from black angus brisket to barbecue pork belly, there is something for all meat-lovers to sink their teeth into. The one-kilo black angus tomahawk steak basically melts in your mouth and is the perfect size for sharing or if you want a hefty meal for one. If you’re not quite done by the time your plates are cleared, check out the dessert menu. Try the fried apple pie with cinnamon and apple ice cream — it might not be a light finish, but it will be a nice equaliser to the main’s smoky flavours. In the heart of the city, just on the outskirts of Chinatown, you’ll find one of the top picks for slow-cooked American-style barbecue in the city. 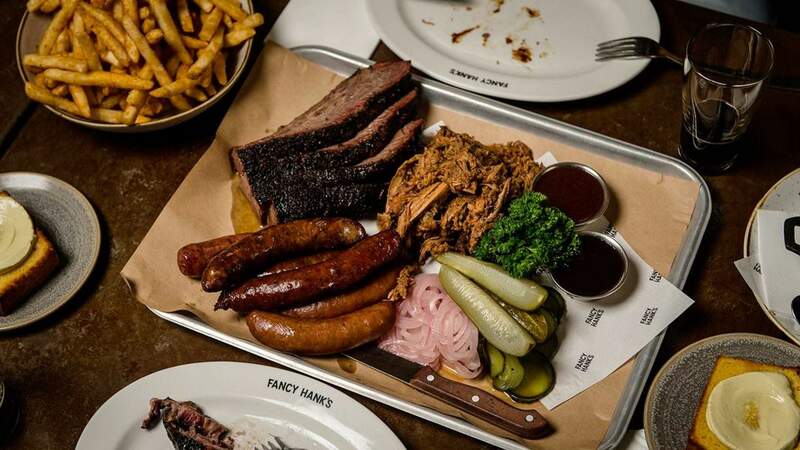 Fancy Hank’s — which used to be located at the Queen Vic Market until earlier this year — does everything from beef brisket and chicken wings to a full stack of beef short ribs. Traditionally, vegetarians would shy away from a barbecue joint, but Fancy Hanks is changing that, with half of the menu being vegetarian — think barbecue cauliflower and smoked eggplant drizzled with ranch dressing. The team also makes its own pickles — a welcome accompaniment to the heaviness of the meat — and has sides aplenty, like barbecue fries, buttery mac and cheese, and a full-range of salads (the potato salad is a winner with a miso dressing and grain mustard). If you’re looking for a pre- or post-meal drink, the restaurant also has its own rooftop bar Good Heavens. It’s got a stellar selection of cocktails, and you can also order from the restaurant menu. 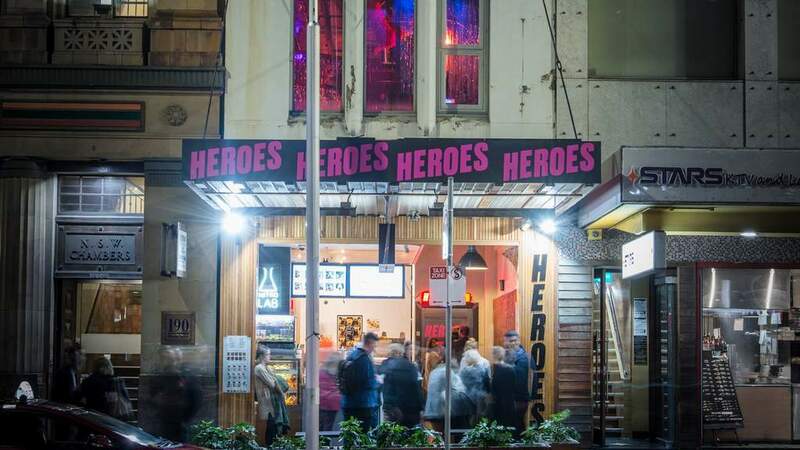 Heroes comes from team behind Fancy Hank’s, but, instead of featuring American-style barbecue, the kitchen takes its inspiration from the hawker halls of Malaysia and Singapore. As such, lunch features a smaller selection of traditional dishes such as nasi lemak (fried chicken with coconut rice and sambal sauce) and minced pork dry noodles, as well as a salad so you can get your greens in. Dinner is more extensive, starting with the selection of skewers: chicken satay, beef rendang, eggplant and even duck heart. Bigger plates include tingling szechuan brisket, a fish cooked in sambal, and roasted butternut with miso and pumpkin seeds. The bar even does karaoke most nights of the week (there’s even a cheeky $200 bar tab up for grabs if you win the Thursday night comp) and a late-night menu crispy prawn crackers and curry fries with sambal mayo: delish. Chris Lucas’s Kong uses Korean and Japanese barbecue techniques to create a unique offering in Richmond. With house-made kimchi and a menu including dumplings, wings, burgers, salads, rice and the infamous barbecue pit, there is something for every eater here. The focus is on everything spicy, with barbecue baby back pork ribs slathered in crazy horse chilli (something to clear your sinuses, for sure) as well as a juicy pit-roasted chicken with crispy bean sprouts, salty nori puffed rice and hot and sour sauce. 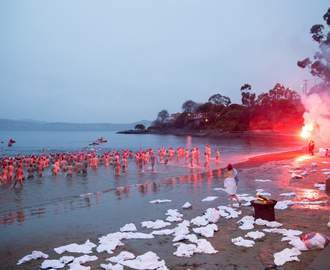 This barbecue isn’t for the faint hearted. If you can’t really decide what to get, the Kong Bossam BBQ Tray — it pulls out all the stops with chicken, miso lamb, pork belly, smokey brisket, and some lettuce and kimchi for good measure. Preston’s Dexter is home to Melbourne’s sort-of famous hot meat doughnuts. And while they are enough reason to visit along, luckily, the rest of the American-style barbecue menu is just as good. Start off small with the smoked lamb ribs in sweet and spicy sauce, or the Korean beef tartare with wild plum syrup and nashi pear before tucking into the big guns: the meats. All coming with bone marrow mash, bread and pickles, you can pick your piece of meat and then get it smoked to order. With point-end brisket, caramel short rib, eggplant and a smoked whole chicken on the menu, we won’t be going hungry anytime soon. Plus, you can get the meats in a bun if you choose. Wash it all down with a can of Mornington brown ale, an orange riesling or a spices G&T. 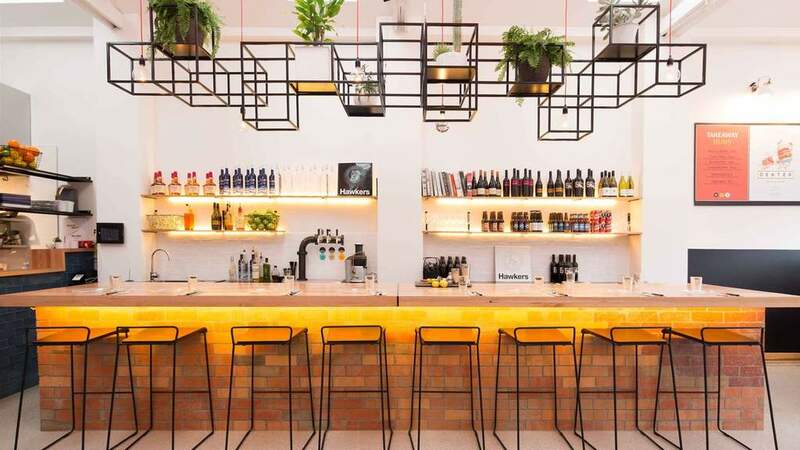 ‘Meat, eat, repeat’ hangs on the wall in neon at Chop Shop — and it’s a phrase that rings true at the Korean barbecue eatery in the CBD. 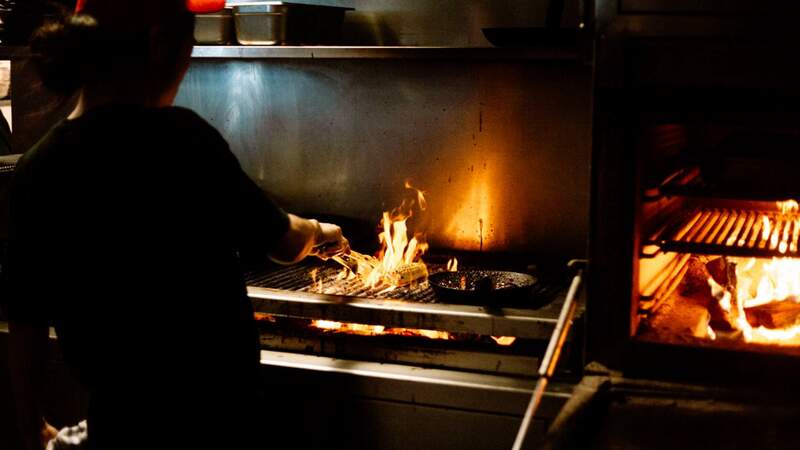 Here, you have the fun of not only ordering from the extensive menu, but being able to cook your meat at the table, too. First up, you need to choose between a set featuring either pork, beer or wagyu — or a combo — then add on extra cuts of meat if you wish. Then, if you’re still feeling peckish, add on some of the side dishes such as kimchi pancakes, spicy rice cakes and noodle soups. Then, you cook, eat, and repeat. 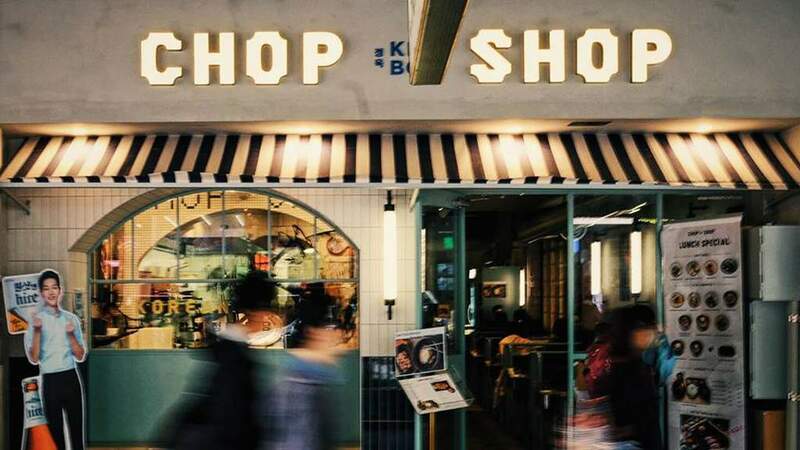 Chop Shop also has wintery slow-cooked Korean stews and sizzling noodles such as beef bulgogi and mushroom and assorted seafood, if you’re not feeling brave enough to cook at your table. This is the best spot in the CBD to tackle your Korean barbecue cravings with a side of peach soju. 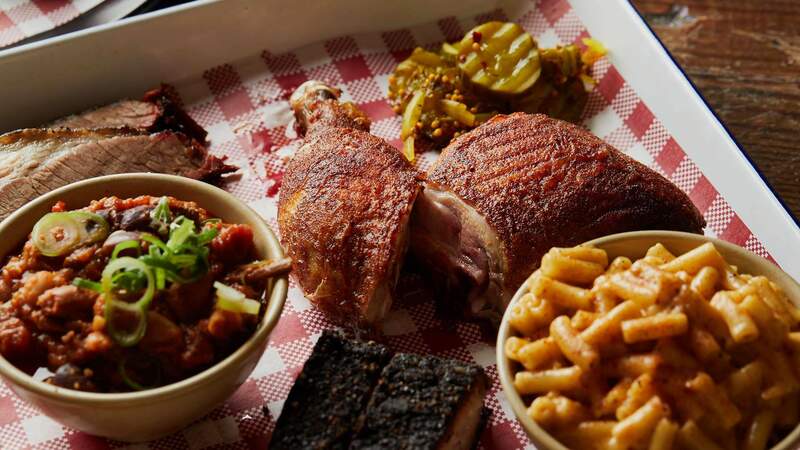 This Footscray barbecue joint does a top take on traditional American-style barbecue with smokey flavours, a neighbourhood feel and a rustic interior. You don’t have to go the whole hog here, either; you can start — or fill up on — on lighter snacks like stringy fried mozzarella sticks, corn tacos with quesco fresco brisket burnt ends and smoked sweet potato hummus dip with tortilla chips. 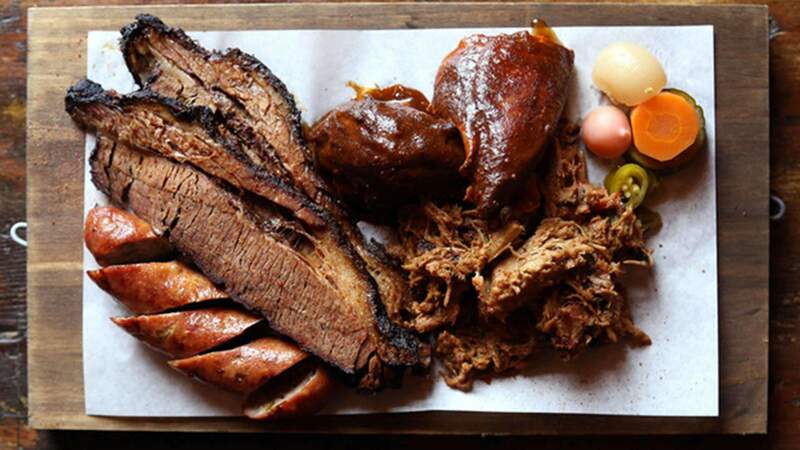 The meats are standout, with beef brisket, pulled pork, sausage and free-range chicken on the menu. We also recommend stopping by at lunch for its Up in Smoke sammie. It’s filled with brisket burnt ends, slices of American cheddar, chilli mayo slaw for some extra spice and barbecue sauce, for good measure. If you’re feeling extra cheeky, add the barbecue rub fries on top of your sandwich for extra saltiness, we don’t judge. Paying tribute to the food and atmosphere in New Orleans, Le Bon Ton showcases traditional dishes and cooking techniques from the Deep South. The brothers heading up the kitchen were born and raised in Texas, and have spent their lives curating a menu that best represents these traditional flavour pairings. Their Southern Pride menu does just that, with fried chicken and crispy onion rings heading the entrees. The Smoker’s Lot features Angus beef brisket, a slow-cooked pork shoulder, lemon pepper-rubbed chicken and spicy Cajun sausages for the whole table. Add some extra nibbles such as the potato salad, tangy coleslaw and jalapeño and cornbread muffins to finish, and you probably won’t need to eat for at least 24 hours. It’s also open until 6am on Friday and Saturday nights so you can feast at any time of the night. With a rockabilly theme and a rowdy atmosphere, Collingwood pub The Gem has pumped out local music and barbecue since 2006. 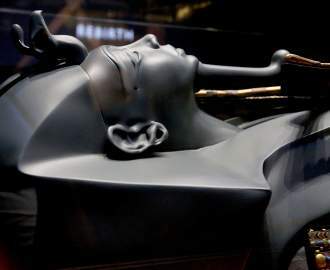 Apart from its shrines to The King, it also has a fully catered upstairs bar and four dining rooms, so there is no shortage of space to feast in. 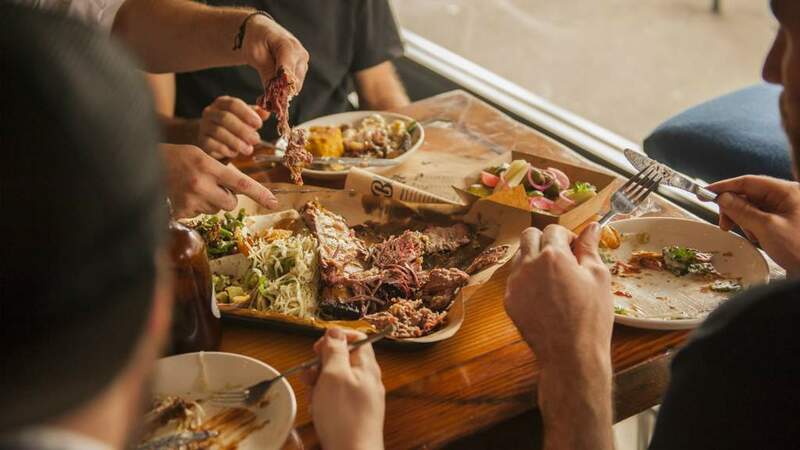 Barbecue night is notably on a Wednesday (you can get a half-pound of meat with two sides for $28), but you can chow down on their slow-cooked meats every night of the week, from Cape Grim beef short and Carolina-style chopped pork. The team also has enough sides to keep you full: smoked hot wings (which are $1 from 4–7pm Tuesday to Friday), brisket loaded fries and pit-smoked beans with sour cream and guacamole. Those who prefer things of the veggie variety, don’t fret, because vegan nachos and a range of pit-smoked vegetable dishes are on offer (the whole roasted winter squash with maple chilli glaze is our pick). Focusing on the fine dining side of the barbecue world, Meatmaiden dabbles in dry-aged steaks as well as some great cocktails to wash it all down. 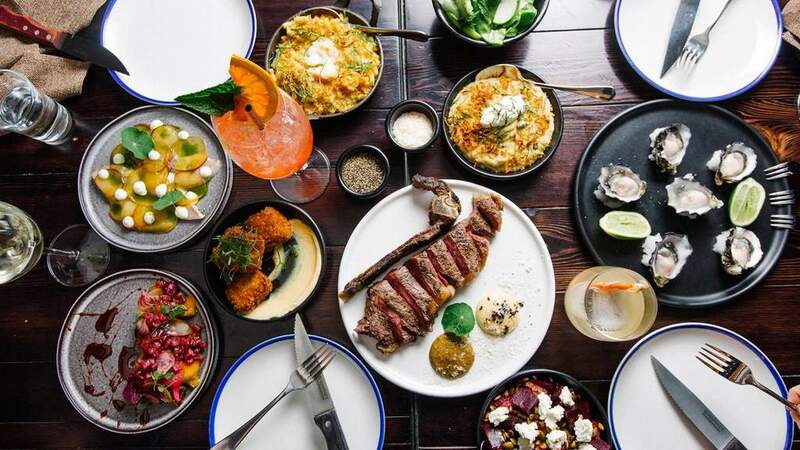 It has a couple of different options for CBD dwelling meat lovers, including a well-prices express lunchtime menu (that’s $30 for a starter, main, side and drink), as well as a fully stocked dinner menu of delicious flavours. You can opt for a full-table banquet or pick and choose as you like. Meatmaiden uses the smoker and grill to get its meats super tender, such as a saltbush lamb shoulder and the barramundi. But the steaks are the cream of the crop here — with over five cuts to choose from, you’re not going hungry anytime soon. Pair it with some rosemary salt fries and you have one of the city’s best steaks. Top image: Fancy Hank’s by Eugene Hyland.